For the second year, H&M is creating another eco-friendly Conscious line that focuses on organic materials and sustainable sourcing. This year, they’re also doing a “Glamour” collection of formal attire in addition to green-themed tees and sundresses. They’re calling it red-carpet inspired. Instead of sequined ball gowns, you’ll find plenty of maxi and mini dresses that would work for spring and summer weddings. The collection arrives on April 12, but only available in 100 stores worldwide. In today’s bustling society, especially in HK – a city that never sleeps -sometimes 24 hrs a day isn’t enough. 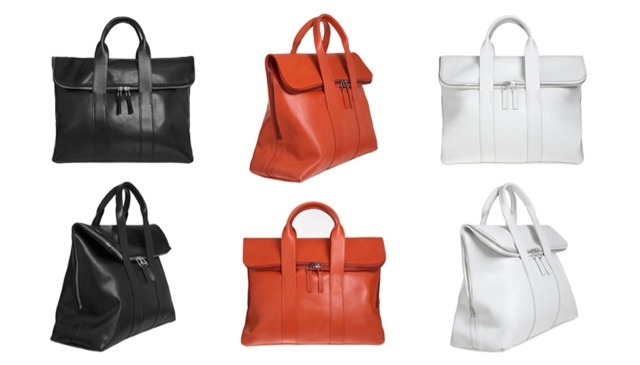 This is what inspired Philip Lim to create this 31 Hour bag. The idea was to create a bag for the 31-hour person – someone who leads an interesting, busy and demanding life. We all need more hours in our day and the 3.1 customer is no exception to that. The main idea of the bag is to make the bag multi-functional and pragmatic, something that could transition with you throughout the day and not define what you are doing or where you are going. The bag is for someone who lives life to to the fullest. The hardware was designed to be subtle but signature. The zipper pulls are solid brass, nothing too overwhelming. The leather is a full-grain unlined calf skin which wears so beautifully with time. Colors will range from “fizzy lemon” and metallics to classic neutrals, cognacs, and blacks. Will it be the next “it” bag?